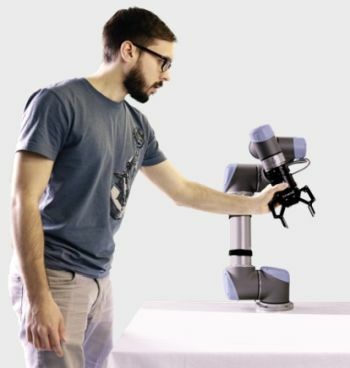 Robotiq offers new tools to help collaborative robots beginners save a lot of time programing their robot. Program templates are now available and ready to be downloaded on Robotiq's online resource center. They simplify the robot's programming so it can be put to task in a record time. "Even the simplest robot on earth requires to be programmed," explains Robotiq Integration coach David Gariépy. "We pre-programmed the most currently used features to offer a user-friendly solution that helps many people at the same time. The basic coding is already done so new operators have something to start with." The Program Templates facilitate the implementation of many common applications using Robotiq products and UR robots. Every package includes a program file containing the template for a specific application, a step-by-step procedure describing how to use the application itself, and a demonstration video. These new program templates, built with the Do It Yourself mantra in mind, allows automation pros beginning with collaborative robots to hit the ground running with a pre-built program structure that is easier to adapt to their production's specific needs. Four program templates are now available on Robotiq's website, with a new program expected to come out every week. To get program templates, click below.